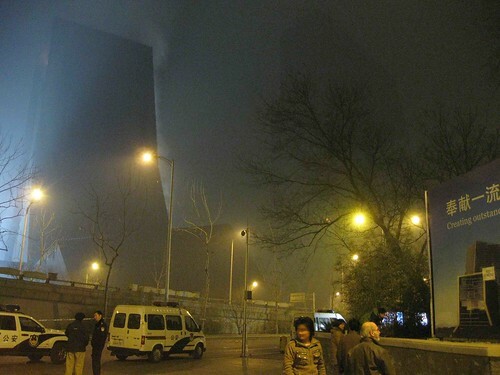 As of 1:00 AM, hundreds of people were still gathered around police barriers (some holding their dogs), taking photos and videos of the smoldering building, while water cannons were intermittently shot at both the north and south facades. 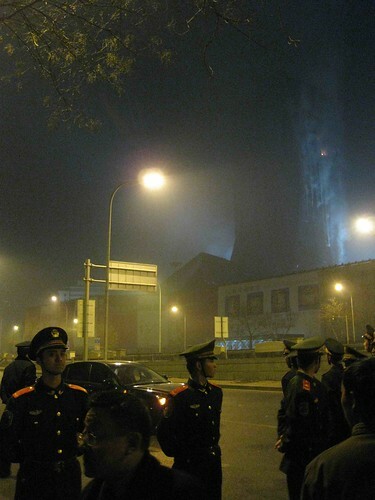 It’s a misty night and, through the haze, the building, which was lit by floodlights, appeared to be burnt to a crisp. From the south side, two fires were still flaring at what looked like about the 15th and 30th floors. Seven firefighters were reported injured, one fatally from smoke inhalation. Maybe it’s our cynicism–or boredom–that makes us (or some of us, at least) want to aestheticize such things, but the scene was eerily beautiful. You wonder what Rem’s take on this would have been had he been there, especially if it wasn’t his building.